A beautiful newly reowated, 115 square metres, apartment on the second floor in a 1940's three story house. 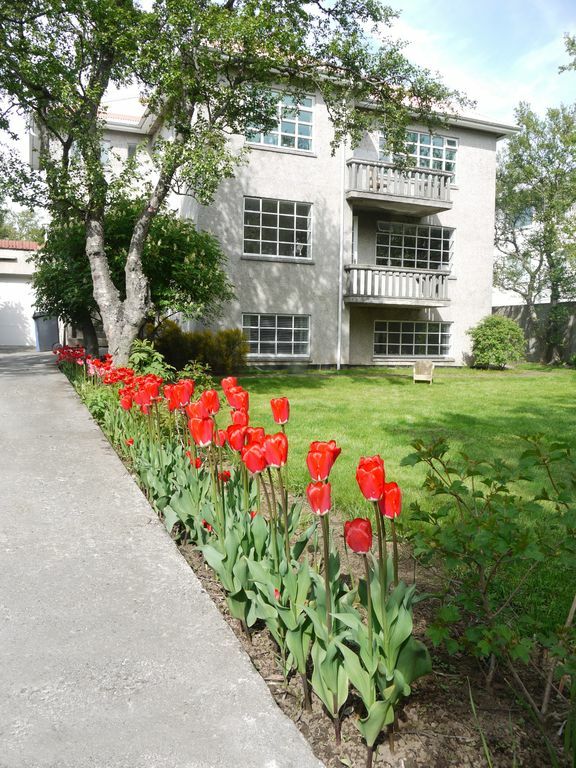 Perfectly located across the park, Klambratun, and in only ten minutes walking distance from down town area of Reykjavik. The apartment sleeps three with one master bedroom, one single bedroom and a beautiful brand new bathroom with a big glass shower. 100% down duvets in all beds, hotel quality pressed linen and towels provided. A spacious living room with a 50in flat screen tv, DVD and Netflix and a dining room with a 250cm glass dining table and access to the apartments balcony.Well equipped newly renovated kitchen. Museum Kjarvalstadir which is located at the park, just across the street, is a nice place to enjoy some art or just a cup of coffee after a nice afternoon walk. I am an artist with a Master of Fine Arts degree from the School of Visual Arts in New York where I lived and showed my work for several years. Since moving back home with my husband and our little seven year old boy I’ve gotten more involved with my other creative passion which is breeding horses. Down duvets and hotel quality pressed linen. The minimum of one fresh per day per guests during stay. 50 in flatscreen smart tv with croamcast. Easy street parking. Curated furnishings and art. Comfortable beds in two bedrooms. Hjordis was very helpful. Typical H2S smell with water - normal for region. This is a great place, exactly what we were looking for. Situated a short walk away from the main shopping area and walking distance to the central bus station. The apartment is full of art literature and stunning photography. It reflects perfectly the laid back verve and vibe of the city. This is a lovely place to chill after a day out and, to be honest, I wish I was still there. Hjordis was a pleasure to deal with, efficient with good comms. We had a great stay at his stylish, yet cosy apartment, located in a smart neighbourhood (opposite a park) It is less than 5 mins drive from the City Centre or I would say 25 mins or walking. Parking is easy and free in the road outside the property. Totally recommend staying at this property and we would definitely stay here again next time we're in Iceland which will be soon I hope! Thank you so much for the lovely review, so glad you enjoyed your stay in Iceland and at our apartment. about the walking distance to the down town area is not accurate. We actually recorded this with a stopwatch to make sure we were providing the correct information and walking to Skolavordustigur from the apartment takes 9 minutes and Laugavegur 8 minutes. For our future guests we will provide a map and directions to make things more convenient. We stayed 4 days in Feb and had a wonderful time. The hosts were very accommodating and helpful. Offerering lists of local restaurants and even tips for the area. Parking and WiFi are included. The beds are comfortable and linens are very soft. Bathroom is updated with an amazing rain shower. Kitchen had everything you would need. Overall the apartment was very clean and modern. We would stay here again anytime! This apartment, very close to the city centre (about 10 minutes walking distance), is absolutely beautiful! Delicately furnished, spacious, fully equipped - we can´t praise it enough! Btw: The beds are super comfortable! We would have loved to stay longer than three nights. Hjördis is a wonderful host, very helpful, easy to contact. We recommend this apartment 150%!